← Zero tolerance for female genital mutilation in Eritrea? For Tanzania, the discussion about ESR is relevant for a number of reasons. First, Tanzania has ratified various international and regional instruments relating to the protection of social and economic rights. Secondly, presently the United Republic of Tanzania is in the process of enacting a new constitution. It is also relevant because despite having enormous land, mineral, water and many other physical resources, Tanzania is one of the least developed countries and more than half of its population live below poverty line. Furthermore, poverty rates are even more appalling in rural areas where 48% of rural households can hardly afford two meals a day. 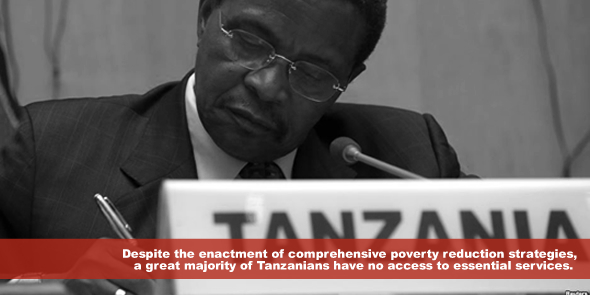 Despite the enactment of comprehensive poverty reduction strategies and a great deal of government expenditure on social services such as healthcare, social security, food, water and education, a great majority of Tanzanians have no access to these services. It is therefore an opportune moment to advocate for increased recognition and constitutionalization of ESR as a complementary approach in the fight against poverty, exclusion and social injustice. Indeed, the proposed constitution has some interesting provisions about the centrality of international human rights and particularly greater attention extended towards ESR. Together with the broader goal of enforcing general values, practices and principles of the Universal Declaration of Human Rights and other conventions and treaties ratified by the United Republic of Tanzania, the final draft of the proposed constitution has some particular reassuring propositions in terms of protection and observance of human rights. In particular, there are proposals to entrench the right to education, water, healthcare, labour rights and the rights of vulnerable groups such as children, women, elderly, special groups (minorities) and disabled persons. The right to free and quality primary education is drafted in concrete terms (Art 52) but for post-primary education the formulation is a relatively weak one of a right to access education. Rights of a child are also more pronounced compared to the content of the rights of a child in ordinary statutes. The proposed supreme law recognizes children’s’ rights to good nutrition, healthcare, residence, guardianship, and protection from harm and violence. Disability rights include right to respect, recognition and upholding of dignity of disabled persons, right to appropriate education, suitable employment, public participation and representation (Article 55). For the elderly, it is proposed that the state authorities shall be obligated to provide basic assistance (Article 58). Women’s rights include freedom from violence and exploitation, equality of opportunities, protection from harmful customs, and the right to decent healthcare. Unfortunately, the proposed law picks from the rights of the vulnerable groups and does not endeavour to replicate the main corpus of social and economic rights under the ICESCR. There are no general universal guarantees of ESR as claims entitled to every individual. It is important to note that Tanzania has ratified both the ICESCR and the ACHPR. In accordance with Article 2(1) of ICESCR and the Commission on Economic, Social and Cultural Rights (CESCR) General Comment No.9, one of the key obligations for implementing the ICESCR is the adoption of legislative measures so as to give effect to Covenant principles and provisions including enabling direct invocation of Conventional rights before national courts. In General Comment No.9, the CESCR has also clarified that virtually all economic and social rights are justiciable. The ACHPR also requires member states to adopt legislative measures to give effect to rights recognized therein. As a party to the ICESRC and ACHPR, Tanzanian is therefore obligated to incorporate economic and social rights into its national constitution and provide for possibilities of invoking such rights before national courts. While the recognition of the rights of vulnerable groups is commendable, in principle, the approach of constitutionalizing narrow sets of these rights does not fully discharge Tanzania’s overall obligations to give effect to ICESCR and ACHPR. Moreover, given the reality of extreme poverty, illiteracy, social inequality and exclusion, it is unwarranted that the proposed law omits to recognize basic necessities of life such as adequate nutrition, housing, healthcare, education, social security and water all of which are crucial for the livelihoods of the majority of Tanzanians. Even the preferred rights of such vulnerable groups are recognized in a relatively limited fashion. For instance, the proposed constitution omits the right of persons with disabilities to adequate standard of living and social protection. Regarding ESR, article 55 provides that “a disabled person has a right to… (e) work and employment, (f) adequate healthcare services, safe delivery, habilitation and rehabilitation.” The right of disabled persons to adequate food, clothing and housing is not recognised. The proposed constitution also overlooks the right of children to social security and social insurance. Overall, the aspiration to constitutionalize these rights is creditable considering the weak normative base of ESR in Tanzanian legal system. However, if the principal aim is to give effect to valuable principles of the Universal Declaration of Human rights and other human rights commitments of the United Republic, a more wide, positive and complete formulation of these rights is warranted. Interestingly, in interpreting human rights provisions of the constitution, the proposed constitution requires courts and other authorities to take into account relevant international human rights treaties and social rights (Article 65). This is of course a back-pedalling since the first draft proposed for direct application of the provisions of human rights treaties ratified by the United Republic of Tanzania. Presently, the Tanzanian Constitution requires parliament to deliberate and ratify all treaties and agreements to which Tanzania is party for such treaties to take effect domestically. But even without direct applicability, these laudable proposals if eventually adopted would considerably weaken claims of non-justiciability of ESR and provide further normative ground for courts to interpret and enforce ESR more effectively especially regarding their indivisibility and interrelatedness. Daniel Marari is a human rights lawyer and researcher, and a 2014 graduate of international human rights law from Lund University. great piece of work brother marari, congratulation for this great work. Reblogged this on Demokrasia, Haki za BInadamu na Utawala wa Sheria.